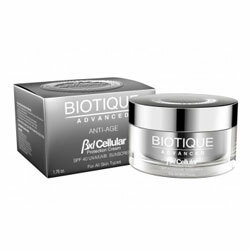 Biotique Advanced - Worldwide Shipping. Our most technologically expert line of natural treatment products to help replenish and restore the skin's youthful appearance. Breakthrough results with new BxL technology to supercharge skin. Precision recipes for daily and special skincare needs at every age. Products designed to work together for optimum results in no time. Ancient becomes advanced for the eternal youth of your skin. The wisdom of traditional Indian medicine and ingredients. The science of clinically proven Swiss bio-technology. The dawn of advanced, bio-energetic, naturally therapeutic treatments for skin of any type, at every age. BXL Cellular Protection Cream SPF 40 is an ultra-soothing,anti-wrinkle sun cream for the face and sensitive skin areas. Broad spectrum UVA/UVB filters.40-times-natural-protection in the sun.Enriched with moisturizing and brightening botanicals to preserve skin fairness,softness and firmness.Powered by exclusive BXL Complex for the most energizing,nourishing and strengthening skin effects. Apply before sun exposure and reapply after perspiring or swimming.